M.Ed, B.Ed and B.Ed. 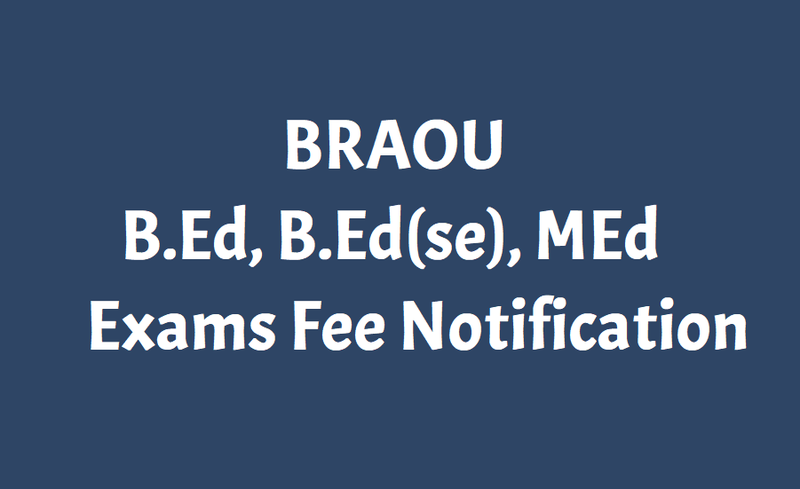 (SE) I Year and II Year Theory & Practicals Examination Notification and Exams Time Table, BEd, BEd(SE), MEd I & II Year Exam Notification 2019: Dr. B. R. Ambedkar Open University has issued M.Ed I Year, M.Ed. II Year Annual Exams and Dissertation Examinations, B.Ed. I Year theory Examinations, B.Ed. II Year Theory & Practicals Examinations, B.Ed. (SE) I Year Annual Exams and B.Ed. (SE) II Year Annual Exams & Practicals Examinations Notification and Examinations scheduled has been issued. These all examinations held as per given scheduled for the students who have been admitted during the year (New) and Old batches and previous batches. డాక్టర్‌ బీఆర్‌ అంబేద్కర్‌ ఓపెన్‌ యూనివర్సిటీ బీఈడీ (స్పెషల్‌ ఎడ్యుకేషన్‌) మొదటి సెమిస్టర్‌ (2015-17 బ్యాచ్‌, బ్యాక్‌లాగ్స్‌), మూడో సెమిస్టర్‌ (2015-19బ్యాచ్‌) పరీక్షలు డిసెంబర్‌ 27 నుంచి నిర్వహిస్తున్నట్లు వర్సిటీ అధికారులు గురువారం ఒక ప్రకటనలో తెలిపారు. మధ్యాహ్నం 2 గంటల నుంచి సాయంత్రం 5 గంటల వరకు సెమిస్టర్స్‌ పరీక్షలు ఉంటాయని పేర్కొన్నారు. పరీక్షకు హాజరయ్యే విద్యార్థులు డబ్ల్యూడబ్ల్యూడబ్ల్యూ.బీఆర్‌ఏఓయుఓఎన్‌ఎల్‌ఐఎన్‌ఈ.ఇన్‌ పోర్టల్‌లో డిసెంబర్‌ 8వ తేదీ వరకు రిజిస్ర్టేషన్‌ చేసుకోవాలని తెలిపారు. ఫీజును టీఎస్‌, ఏపీ ఆన్‌లైన్‌ సెంటర్ల ద్వారా లేదా డెబిట్‌, క్రెడిట్‌ కార్డుతో మాత్రమే చెల్లించాలని పేర్కొన్నారు. The B.Ed. (Special Education) 1st Semester (Backlogs) & 3rd Semester Examinations of Dr. B.R. Ambedkar Open University are scheduled to be held from 27.12.2018 to 08.01.2019. All the students, who fulfil the Attendance requirements during the Workshops, are only eligible to appear for the Theory examinations of 1st & 3 rd Semesters. The registration for the examination is through online only. The students are advised to visit the Portal of www.braouonline.in and click on Exam Registration. Apply online and pay the prescribed fee at any TS/AP online centres through any Debit/Credit card The students have to pay both the practical fee and theory exam fee by way of a single payment. Please keep Xerox copies of the print out and payment receipt received by the candidate after registration and uploading the information through T.S. / A.P. online for future reference whenever necessary. The online registration and payment of examination fee commence from 28.11.2018. For further details candidates may contact their study centres. The examination registration forms without online are not allowed by the University and no further correspondence will be entertained. The students are advised to collect the Examination Registration Forms from their respective Programme Centres. The students, who fulfill the attendance requirements during the Workshops, are only eligible to appear for the Theory Examinations of I Year and II Year Exams. The payment of Examination Fee and submission of examination application forms commences from 30-11-2018. Last Date for Examination Online Registration and Payment of Fee : 08-12-2018. 1. The payment of Examination Fee and submission of examination application forms commences from 30-11-2018. 2. Last date for receipt of filled in application forms at the Programme Centre is 08-12-2018. 1. Candidates are requested to use Examination Registration Forms for registering M.Ed or B.Ed. or B.Ed. (SE). Examinations that are provided at your Programme Centres at free of cost. for M.Ed. Examination is 36. For B.Ed. Examination is 29. 3. Candidates are required to fill the details under the Column No.7 given under the heading for First Year Theory. 1. M.Ed First Year Rs.750/-(Rs.150/- for each Theory paper). 2. M.ED Second Year Rs.950/-(Rs.150/- for each Theory paper + Rs. 500/- towards dissertation submission). 4. B.ED Second Year Rs.750/-(Rs.125/- for each Theory paper and Practical paper). 5. B.Ed(SE) First Year Rs.625/-(Rs.125/- for each Theory paper). 6. B.Ed(SE) Second Year Rs.1000/-(Rs.125/- for each Theory paper and Practical Paper). The fee is to be paid through a crossed DD from any Nationalized Bank preferably SBH drawn in favour of The Registrar, Dr. B.R. Ambedkar Open University, Hyderabad payable at Hyderabad. 5. The Examination Registration Forms sent directly to the Controller of Examinations will be rejected. They should be submitted at their respective Programme Centres only.